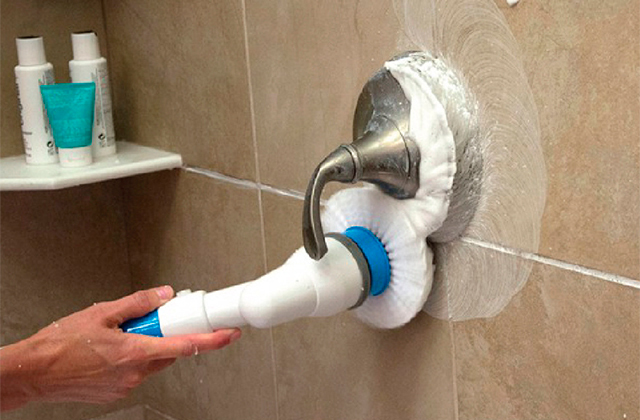 The mop head rinse agitator will allow you to wash the mop as you use it, essentially providing you with a mobile washing machine inside the bucket. It also comes with a built-in soap dispenser. 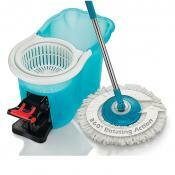 The company's patented pedal-free handle-driven spin drive makes this spin mop system a much more mobile solution. Not the smallest or lightest option out there so it'll take some space. The product from Mopnado is, very likely, the best spin mop that the market has to offer for people with a spacious place of residence or for those individuals that have different types of floors in their house. The self-wringing mechanism requires nothing but a gentle push on the handle in order to spin off the excess water. 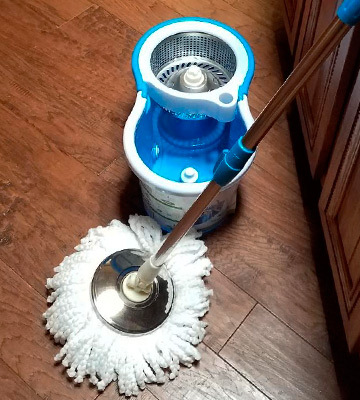 The mop head dries five times faster compared to a typical foot pedal model, all while wringing the floor two times dryer. It also absorbs eight times its weight in water. Some of the water may spill during the spinning process. We would recommend the mop system in question to those customers that do not like to deal with the inconveniences of those mop systems that rely on foot pedals, spinning axis, and other often unnecessary moving parts. The foot pedal allows the user to have full control when it comes to deciding the level of moisture of your mop. 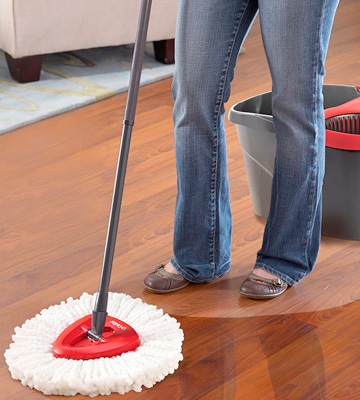 The unique triangle design of the mop head will allow you to clean the sharpest corners. The pad is made of microfiber that gets rid of the toughest dirt and grime without relying on nasty chemicals. The package doesn't include additional mop heads. 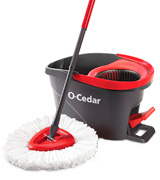 Quite a lot of people could benefit from having the O-Cedar 140743 EasyWring Microfiber Spin Mop in their arsenal of household tools and appliances as it will allow them to save a lot of time and effort cleaning the house. Adjustable up to ~ 49.5"
The self-balanced design will prevent any water from spilling out as you carry the bucket around the house. 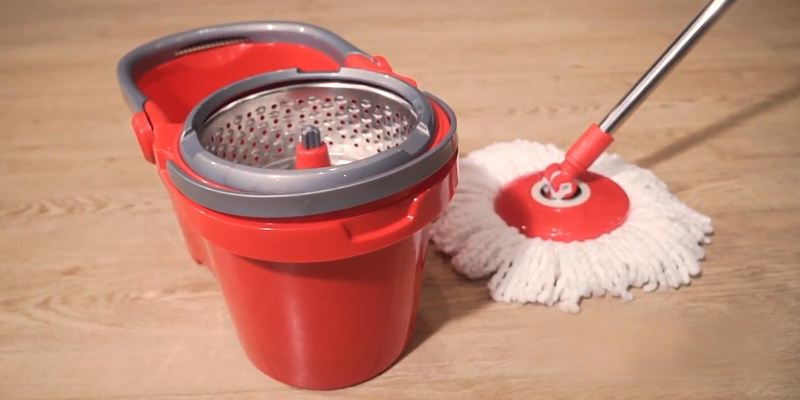 The easy-press technology requires no effort from the user, just press the handle against the bucket and spin it a few times in order to dry the mop head in a matter of seconds. The end of the handle may stick through the mop head. If you are the kind of person that puts a decent amount of stock not just into the performance aspect but also the details and components that go into that performance, this is exactly the sort of spin mop you ought to be looking for. 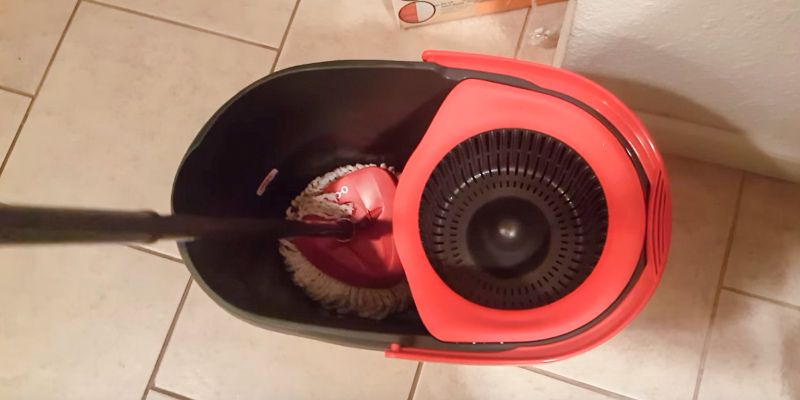 Adjustable up to ~ 45"
The dual-spout bucket and patented centrifugal spinning design will allow you to dry and clean the mop head without the need to get your own hands dirty. The angle of the handle is adjustable as well. The ability to turn it 180 degrees will allow you to find the most comfortable mopping position. The mechanism gets creaky after some time. The Aootek Upgraded Stainless Steel Deluxe 360 Spin Mop will be a pretty good fit for people that value durability above anything else. 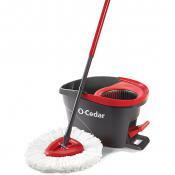 Durability aside, this is also one of the more comfortable and convenient mopping systems in its price range. 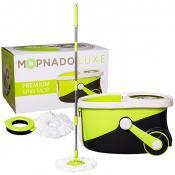 The Mopnado spin mop isn't the cheapest option out there nor is it the most compact one. It will certainly require some space in terms of storage. Nevertheless, if you live in a large house with some serious square footage, this is likely one of the best options for you. That said, to say that you are getting a spin mop would be quite an understatement in itself. What you're getting is a mop system that will allow you to handle all types of floors, including but not limited to laminate, concrete, stone, tile, hardwood, and vinyl. While we simply wouldn't be able to cover every aspect that makes this particular product what it is, we will highlight some of the most important and interesting elements of this model. 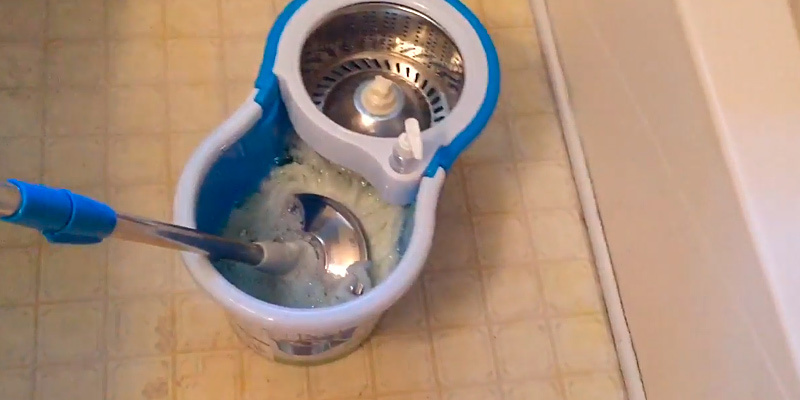 First off, there's the mop head rinse agitator that will allow you to wash the mop as you use it, essentially providing you with a mobile washing machine inside the bucket. 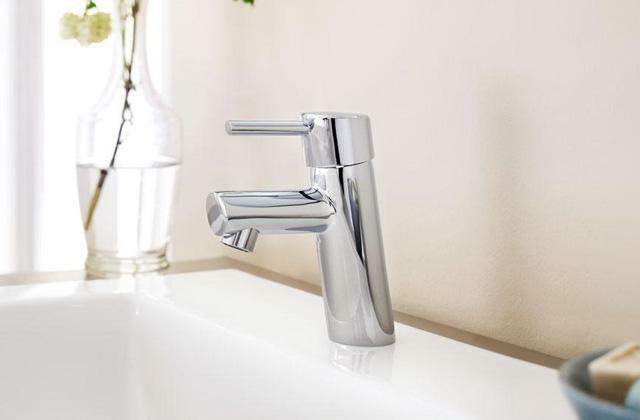 It also comes with a built-in soap dispenser which is about as convenient as it sounds. 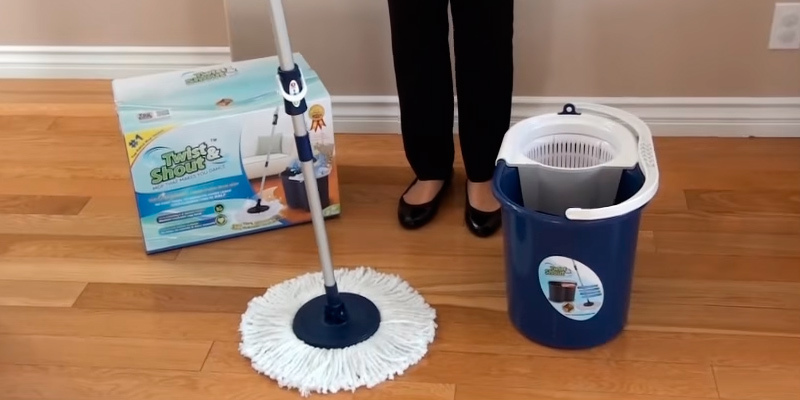 The company's patented pedal-free handle-driven spin drive makes this spin mop system a much more mobile solution as you won't have to pump the whole thing with one foot the way you would with an inferior model. It also comes with large wheels and two handles in order to further improve the already impressive mobility properties. Of course, this isn't some cheap product, so the 180-degree swiveling mop head and a long extendable handle go without saying. Aside from the fact that all of the essentials included in the package are made of top-quality materials, the company decided to go the extra mile and include a couple of spare mop heads and a scrub brush attachment. Considering all of these things, we can safely arrive at the conclusion that the product from Mopnado is, very likely, the best spin mop that the market has to offer for people with a spacious place of residence or for those individuals that have different types of floors in their house. What we have here is the only mop system on the market that offers a lifetime warranty for their customers. So it goes without saying that the company has the utmost faith in their products and they're willing to put their very own money on it. However, even if we take the quality of every component as a given, there is still a question of functionality that has to be answered, as a durable piece of junk that will last for years isn't really worth as much as you would think. With that in mind, the mop system in question doesn't necessarily trail behind in terms of functionality either. The self-wringing mechanism requires naught but a gentle push on the handle in order to spin off the excess water. Besides, the mop head dries five times faster compared to a typical foot pedal model, all while wringing the floor two times dryer. 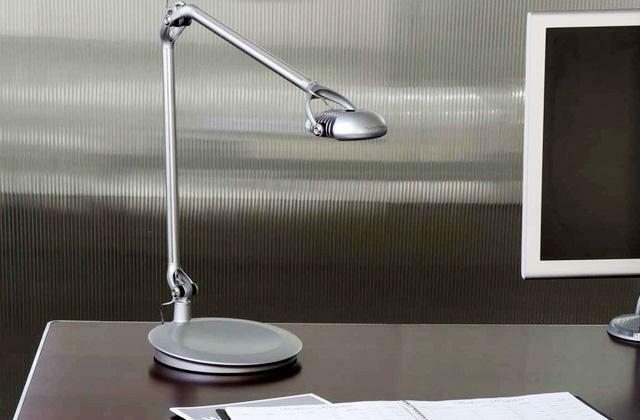 The swivel head is as flexible as these things get. You can pivot it 180 degrees, something that will come in handy whenever you have to clean under the furniture and around the corners. And in case that's not enough, you can also rotate the head 360 degrees to clean the floor by the baseboards. Finally, there's the mop head comprised of microfiber that features the most impressive absorbent qualities as it is capable of absorbing eight times its weight in water. 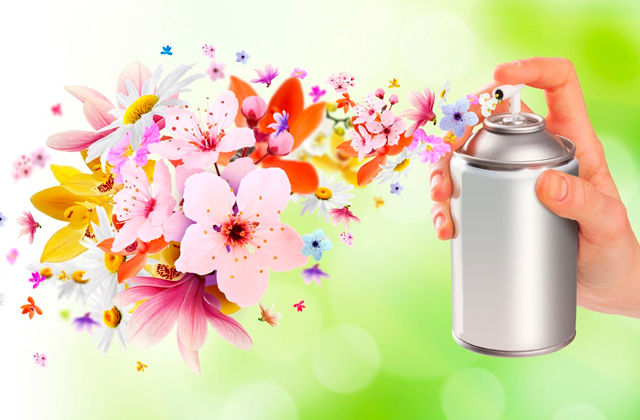 As you would imagine, this will save you a lot of time during the cleaning process, a time that is better spent on other, far more pleasant and exciting activities. Having said all of that, we would recommend the Twist and Shout Mop TNSM-T1 Hand Push Spin Mop to those customers that do not like to deal with the inconveniences of those mop systems that rely on foot pedals, spinning axis, and other often unnecessary moving parts. 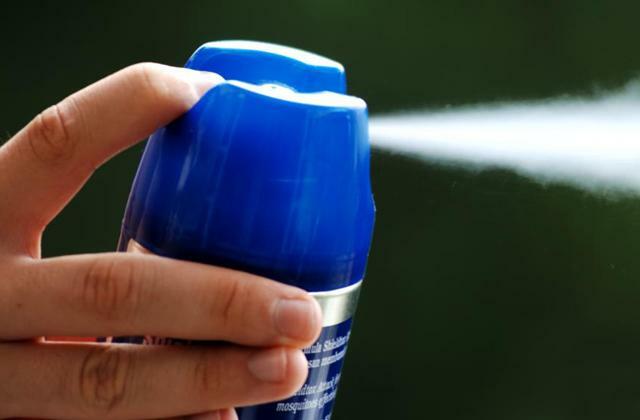 The lifetime warranty that comes with the product serves as a proof that it will be able to last for years. The O-Cedar 140743 EasyWring Microfiber Spin Mop will prove to be a great choice for people that dislike mopping floors even more than the next guy. 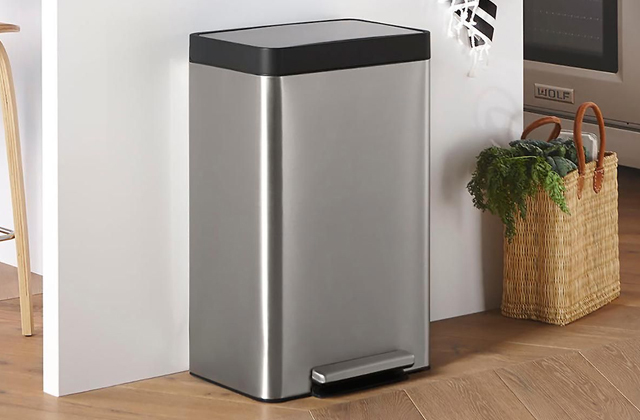 All of the features that the model comes with simplify the process and reduce the time it takes for you to clean the floors as much as humanly possible. The bucket comes with a hands-free built-in wringing system that, well, doesn't require you to bend over and use your hands. All you have to do is simply hold the mop without pushing it too hard into the bucket and step on the foot pedal in order to activate the wringer. Furthermore, the foot pedal allows the user to have full control when it comes to deciding the level of moisture of your mop. The whole thing also comes with a splash guard that will keep all of the excess liquid inside the bucket, preventing it from splashing and spraying all over the place. Of course, the bucket is only half the deal, and it wouldn't be worth much without an equally effective mop to back it up. Fortunately enough, the spin mop isn't the weakest link here either. The unique triangle design of the mop head will allow you to clean the sharpest corners while putting in next to no effort. Naturally, the mop head also rotates 360 degrees, so you will have enough opportunity to maneuver under and around the furniture as well. 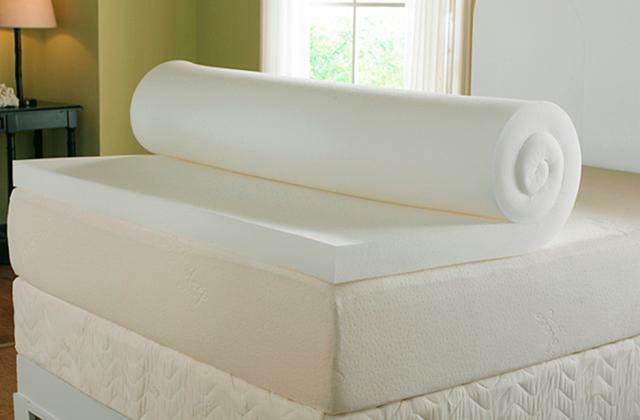 The pad is made of microfiber that gets rid of the toughest dirt and grime without relying on nasty chemicals. To reiterate the point we made earlier, mopping the floors is one of the most universally disliked activities. Which is why so many people could benefit from having this O-Cedar spin mop in their arsenal of household tools and appliances as it will allow them to save a lot of time and effort cleaning the house. The Hapinnex SYNCHKG098122 isn't the shabbiest option out there and it certainly has a thing or two going for it. 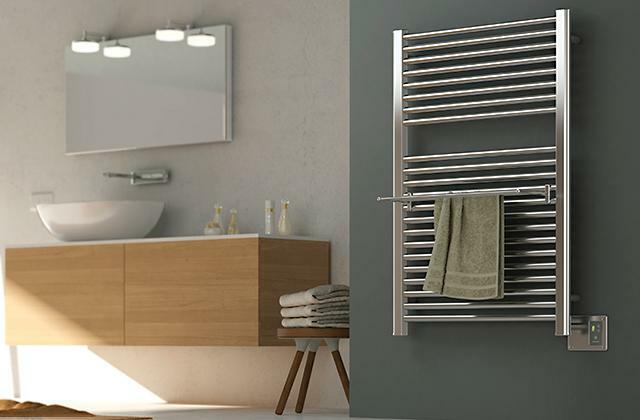 But what makes it so attractive to a pretty considerable number of customers isn't just the necessary parts but also a number of useful and ergonomic details and components that the model comes with. 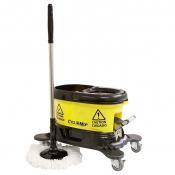 The anti-slip hand grip will allow you to carry the bucket around with just enough comfort to make the entire process of cleaning the floors slightly less tedious. 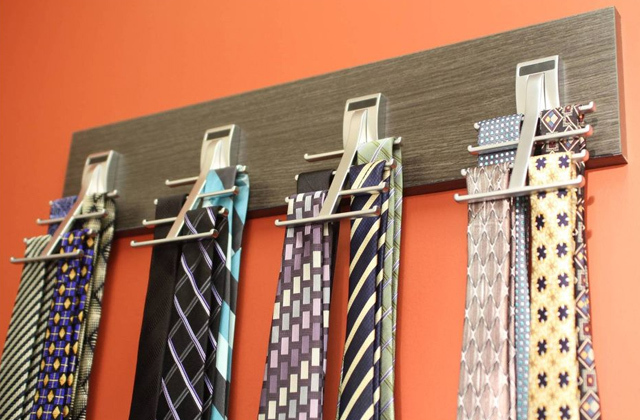 The hanging grip on top of the handle will provide you with some additional options in terms of storage. The durable latch doesn't lose its grip even after years of some serious abuse. 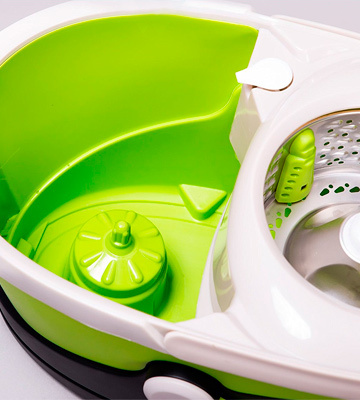 The washer disk and the drain plug do their job without increasing the weight of the bucket, an ergonomic solution that allows the latter to maintain its measly 4 pounds of weight. 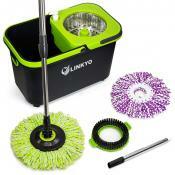 All in all, it is exactly that attention to details that makes the spin mop such an attractive choice. In addition to the microfiber mop head, you will also receive a spare one and a pair of soft cleaning gloves completely free of charge. Nevertheless, the model doesn't really lose in terms of functionality either. The self-balanced design of the bucket will prevent any water from ever spilling out as you carry the bucket around the house. 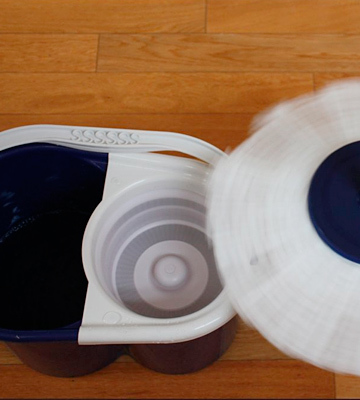 The easy-press technology requires no effort from the user, just press the handle against the bucket and spin it a few times in order to dry the mop head in a matter of seconds. 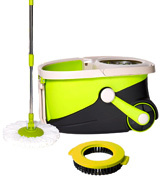 Similar to any other decent mop system, the mop head rotates 360 degrees and the splash guard will prevent the water from splashing around the floor as you wring the mop head. In conclusion, if you are the kind of person that puts a decent amount of stock not just into the performance aspect but also the details and components that go into that performance, the Hapinnex SYNCHKG098122 is exactly the sort of spin mop you ought to be looking for. Aootek Upgraded Stainless Steel Deluxe 360 Spin Mop may not be as deluxe as the company makes it out to be but this is definitely one of the more affordable and well-rounded options that the market has to offer. 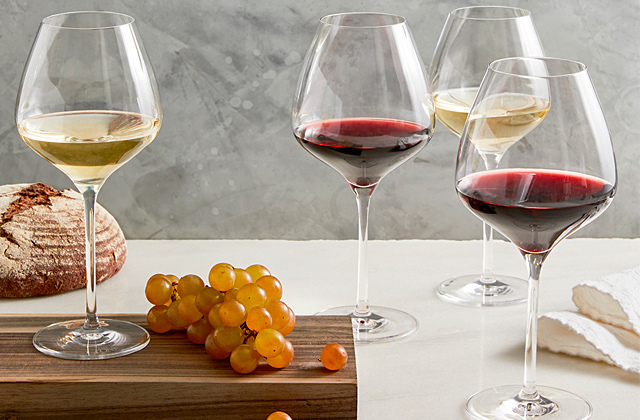 As the name suggests, both the bucket and the handle are made of stainless steel, a solution that makes this product far more durable than its plastic and aluminum counterparts. But, in case something were to happen to it, the mop system is also backed up by a 1-year guarantee. 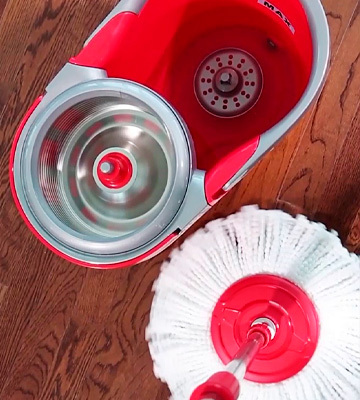 Setting the materials aside, we would be remiss not to mention the dual-spout bucket and patented centrifugal spinning design, both of which will allow you to dry and clean the mop head without the need to get your own hands dirty. 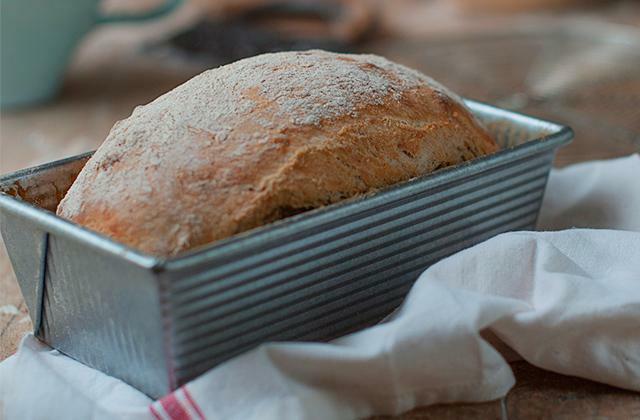 Other than that, the company virtually decided to stick with the basics. 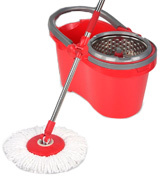 The mop head that rotates 360 degrees is there, providing you with the opportunity to effectively clean not just all kinds of floors around the house but also doors, lobbies, and even cars. The angle of the handle is adjustable as well. The ability to turn it 180 degrees will allow you to find the most comfortable mopping position. 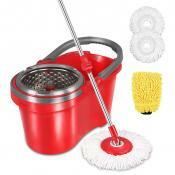 And since the mop head is made of microfiber, the model will effectively remove any dirt without damaging the floor. In short, the Aootek Upgraded Stainless Steel Deluxe 360 Spin Mop will be a pretty good fit for people that value durability above anything else. 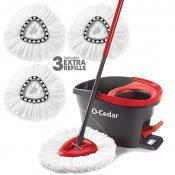 Durability aside, this is also one of the more comfortable and convenient mopping systems in its price range. What Is a Spin Mop? While we all have our own preferences, cleaning the floors usually doesn't make the top ten of things that most people enjoy doing in their spare time. Nevertheless, it is also something that we have to do. And in order to make the process slightly less time consuming and inconvenient, we would like to suggest investing a fairly moderate sum of money into a spin mop. 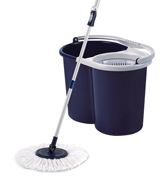 Though what people usually refer to as a spin mop is often an entire mopping system that consists of a spin mop and bucket and features a variety of different solutions designed for user convenience. 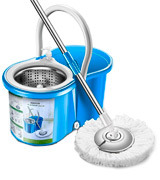 Along with the handle and the mop head that can rotate up to 360 degrees, you will usually receive a bucket that may or may not include a number of different features as well, be it a soap dispenser, an anti-splash guard, or some sort of a wringer. It may not sound like much, but all of these things combined will allow you to waste less time mopping the floors and spend more time on any one of the billion activities that are more exciting. And while we are on the subject of cleaning, you might want to look into our review of the best squeegees that will allow you to effectively clean the windows. 1. Karen Gibbs How often you should mop your floors — and the right way to do it, TODAY. January 10, 2018. 3. Sarah Aguirre, How to Mop Your Floor the Right Way, The Spruce. February 15, 2017. 4. 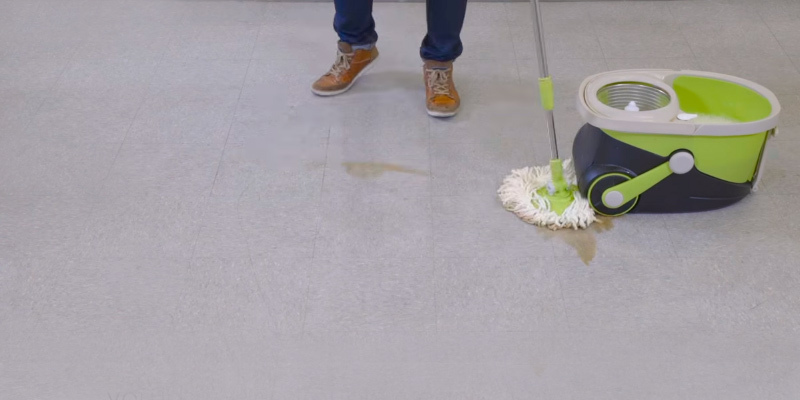 Strategies for cleaning the floor: How to Mop, Cleanipedia.